The USA today reiterated its support to India’s fight against terrorism and said cross-border terrorism continued to remain a “very important” agenda in Washington’s dialogue with Islamabad. The sensitive issue of India’s friendship with the Islamic Republic of Iran, which is now under scanner for its attempts to develop nuclear weapons, particularly long-range missiles which could threaten Israel, came up for discussion during the just-concluded visit of Israeli Prime Minister Ariel Sharon. 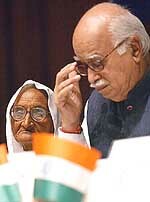 Asserting that Pakistan’s Inter-Services Intelligence (ISI) was not only fomenting terrorism in India but also promoting terrorist organisations like Al-Qaida and Taliban, Deputy Prime Minister L. K. Advani today called upon the world community to stop helping any such country which aids and abets terrorism. The CBI today told the Delhi High Court that the actual loss caused to the government in the Bofors scam was over Rs 100 crore as this was the sum provided for 8.24 per cent commission to accused Hinduja brothers, W N Chadha and Ottavio Quattrocchi for their alleged role in getting the Rs 1437 crore deal awarded to the Swedish arms manufacturers in 1986. 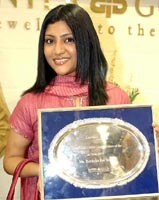 National award winning actress Konkona Sen Sharma being honoured with the 'Women of the Year' award for her contribution to Indian cinema by "Inter Gold", a diamond company, in Kolkata on Thursday. The Union Cabinet today gave its clearance for the privatisation of Delhi and Mumbai airports. Civil Aviation Minister Rajiv Pratap Rudy said the Cabinet, which met tonight under the chairmanship of Prime Minister Atal Bihari Vajpayee, approved the privatisation of the two airports. In its drive to check dengue and malaria in the Capital, the Municipal Corporation of Delhi (MCD) is not sparing even the VIPs and has issued challans to superstar Amitabh Bachchan and Union Law and Commerce Minister Arun Jaitley on finding their premises a breeding ground for dangerous mosquito larvae. Top Indian paramilitary officials said several militant groups have set up bases in Bangladesh. The abrupt end to Israeli Prime Minister Ariel Sharon's visit to India has dampened the spirits of 4,000 Jews in Mumbai. Tamil actor Ajit Kumar migrates from films to motorsports. “The USA will stand by India in its battle against terrorism just as India has stood with the USA in its battle against terrorism,” visiting US Assistant Secretary of State Christina Rocca said here today. “I can also reassure you that cross-border infiltration remains a very important issue on our agenda with Pakistan”, she said while addressing corporate captains at a meeting organised by the Confederation of Indian Industry (CII) here. She said combating extremism was “something which is in the interest of Pakistan and we will continue to encourage Pakistan to do it”. On the remarks of Israeli Deputy Prime Minister Yosef Lapid on the evolution of an “unwritten axis” between India, Israel and the USA to fight terror, she said no discussion had yet taken place on the establishment of a formal axis. 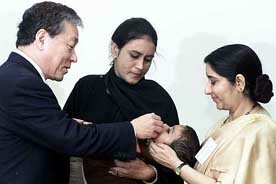 “We are friends with the Government of India. We are friends with Government of Israel. We are always happy when friends meet friends... the relationship between India and Israel is one that we welcome”, Ms Rocca said. She described the recent bombings in Srinagar and Mumbai as “horrific examples” of terrorism and said President Bush had condemned these incidents in no unequivocal terms. “Acts of terror are intended to sow fear and chaos among free peoples. I hope that the perpetrators of these murders will be identified quickly and brought to justice,” she said. She, however, made it clear that her visit to India should not be perceived as one of mission seeking commitment of Indian troops in Iraq. “Contrary to all headlines that everybody has read today, I am not here to discuss the issue of troops or to put any pressure on the Government of India to send troops to Iraq. I am here for bilateral consultations on bilateral regional dialogue”, she said, adding, “Iraq obviously came up in the discussion”. The visiting US official said India’s role in the reconstruction of Iraq was “extremely helpful and important” and envisioned that people of Iraq should be allowed to freedom in a peaceful and stable framework. Earlier, she read out a message from US President George Bush who said the fight against terrorism would be long and difficult. “On behalf of the American people, I would like to extend to you our solidarity and support as you remember your citizens who died in the terrorist attacks in the US on September 11, 2001... The struggle to put an end to terrorism will be long and difficult. We wage this struggle for ourselves and for our children, but also to honour the victims of terror and reaffirm the inherent value of their lives,” Mr Bush said in his message to Prime Minister Atal Bihari Vajpayee. A diplomatic symbolism of sorts was discernible as the visiting US Assistant Secretary of State for South Asia Christina Rocca, today completed her official engagements here but unlike on the previous occasions no senior minister of the Vajpayee government met her. This is because New Delhi cannot send troops to Iraq or to other unstable war zones like Liberia, official sources said. Ms Rocca would be flying back to Washington tomorrow evening but she had no engagements with the Vajpayee government tomorrow either at the official or the ministerial levels, the sources in the US Embassy said this evening. “Ms Rocca has a hectic schedule of internal meetings in the embassy as she is also in charge of embassy works,” they said. Though Ms Rocca herself had categorically denied she was here to discuss the issue of Indian troops for Iraq and in the same breadth said “Iraq obviously came up during discussions”, it was understood that feeling the pulse of New Delhi on the issue was part of the mission. The issue assumed urgency for Washington as the foreign ministers of the five permanent members of the UN Security Council (UNSC) are scheduled to meet in New York on September 13 to discuss the USA’s new draft resolution on Iraq which Washington wants to pilot in the Security Council. The officials said “a significant gap” had emerged in the positions of the USA and other four UNSC members of Washington’s new draft resolution on Iraq. Ms Rocca is understood to have conveyed to the Indian officials that the Bush administration understands the political compulsions of the Vajpayee government and that no government in New Delhi could venture to take such a risk when the crucial Assembly elections are round the corner. During her meetings she drove home a point that New Delhi and Washington should look beyond South Asia in their bilateral ties. She went on record saying that more than 100 senior-level visits of US officials to India over the past several years had featured consultations on issues that vaulted beyond the borders of South Asia. The matter was raised by none other than the Israeli Prime Minister himself during his meetings with the Indian leadership. Tel Aviv expressed its worry over the growing relationship between India and Iran, particularly keeping in mind its cementing ties with New Delhi, specially on the defence and counter-terrorism front. Israel is now very wary of Iran since it believes that Teheran is developing nuclear weapons keeping it in mind as the main target. In fact reports emanating from Israel say that Prime Minister Sharon has decided to hand over the Iran portfolio to its dreaded and dedicated secret agency Mossad for further action. Official sources here said the matter was first raised by the Director-General of Israeli Ministry of Defence Yaron Amos during his meetings with the Indian defence officials and also with Defence Minister George Fernandes. Later, yesterday evening, when Mr Fernandes called on the Israeli Prime Minister, the matter was again raised by Mr Sharon. The Israeli Prime Minister is believed to have clarified his country’s position vis-a-vis Iran and sought specific clarifications from Mr Fernandes as regards India’s relations with that country. The sources said Mr Fernandes clarified to the Israeli Prime Minister that the Indo-Israeli relationship was strictly a bilateral affair. There would be no leakage of Indo-Israeli military transactions to any third country including Iran, Mr Fernandes apparently told Mr Sharon. The issue becomes more of importance due to the close relations that India has with Iran. Israelis are hoping that New Delhi will persuade Teheran to curb development of weapons of mass destruction. While Israel has peace with its Arab neighbours — Egypt and Jordan — Syria and Lebanon do not pose as a military threat. On the other hand, the USA has occupied the other dangerous country Iraq and Palestinians are no match to the Israelis. So the real looming danger for Israel at present is Iran and it is already preparing for the worst-case scenario. Israel is preparing to defend itself, far from home, and has apparently also started some submarine activity in the Indian Ocean. The Israelis believe that India, in fact, could come in handy as a port for it in the worst-case scenario, particularly for it to carry out a second strike from its submarines. Reports here also said that Mr Sharon plans to hand over responsibility for coordinating and leading Israel’s efforts to prevent Iran from acquiring nuclear weapons to Mossad chief Meir Dagan. Mr Sharon’s office believes that it is logical for the mission to move to the Mossad, which can gather intelligence, analyse and assess it and, in the future, perhaps conduct operations. According to Israel Defence Forces Military Intelligence assessments, Iran will cross the point of no return in another year, at which time it will be able to create fissionable material for bombs. By 2006, it will have operational nuclear weapons. For the last six years, Israel has been conducting a diplomatic campaign, primarily with the help of the USA, to block or at least delay the Iranian project. According to the plan, Mr Dagan, who was appointed Mossad chief by Mr Sharon, will coordinate the interministry forum and other bodies will operate according to his instructions and their expertise. In fact this plan has also raised intense opposition in other government bodies in Israel. The opponents believe it is a sensitive diplomatic issue that Mossad, as a security intelligence agency, is not built to handle. Therefore it should focus on its professional sphere rather than dealing with diplomacy. There is also opposition as Mossad has no specific expertise in nuclear matters. “Al-Qaida and Taliban are recognised as terrorist organisations. It is important for India that the world also recognises ISI as an organisation which promotes terrorism,” Mr Advani at a meeting organised by Delhi Study Group (DSG) here to observe “Anti-Terrorism Day”. Emphasising that the fight against terrorism was not against any religion, the Deputy Prime Minister said he had told Israeli Prime Minister Ariel Sharon that New Delhi’s fight was against terrorism and not against Islam. Stating that India did not expect any help from the world to fight terrorism it had been facing for over two decades, Mr Advani said at least that the world should not support those nations and organisations which supported directly or indirectly terrorism. Recalling his talks with US leaders when he visited that country in June during which they had stated that India was “exaggerating Washington’s clout” vis-a-vis Pakistan, Mr Advani said he told the USA, “No I am making a very realistic assessment. I am not exaggerating your influence. I know what is possible”. He said Pakistan handed over 500 Al-Qaida militants to the USA. “I am happy that among the 500 there is no Indian. But when India asked for 20 wanted terrorists to be handed over, Islamabad did not do so”. Mr Advani said the September 11 terror attack in the USA and the subsequent events had brought about a change in the mindset about global terrorism but India had been a victim of the menace for over two decades. As an honour to Param Vir Chakra Abdul Hamid, hero of 1965 the Indo-Pak war, Mr Advani gave Rs 1 lakh and a citation to his widow and also promised to allot a petrol station to the family. The BJP president, Mr M. Venkaiah Naidu, who was also present, regretted that some people linked terrorism with religion and said there was need for change of such mindset. Union Minister for Textiles Shahnawaz Hussain said after the September 11 attack, efforts had been made to link terrorism with Islam. He said people belonging to minority community had occupied top positions in the Indian polity. President of the Delhi Study Group Vijay Jolly said that the terrorism aided and abetted by Pakistan was doomed to fail in the face of India’s committed resolve to fight its own battle. “The actual loss caused to the government was more than Rs 100 crore. Win Chadha was to receive about 2.24 per cent of the total amount, while Hindujas and Quattrocchi were to get 3 per cent each,” Additional Solicitor General Mukul Rohatagi told Mr Justice J.D. Kapoor. 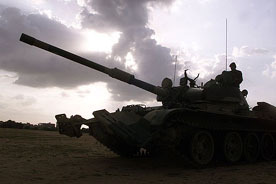 Mr Rohatagi clarified that money beyond Rs 64 crore could not transferred to the accused after the Swedish Radio broke the news in April 1987 about alleged payment of commission by Bofors to secure the contract for supply of 400 Howitzer guns. Mr Justice Kapoor is hearing appeals filed by Hinduja brothers — Srichand, Gopichand and Prakashchand and Bofors Company — against the November 2002 order of Special Judge Prem Kumar framing charges against them in the case. There was a conspiracy behind the deal which was signed in “undue haste” bypassing procedural norms, Mr Rohatagi alleged. The Union Cabinet today gave its clearance for the privatisation of Delhi and Mumbai airports. Civil Aviation Minister Rajiv Pratap Rudy said the Cabinet, which met tonight under the chairmanship of Prime Minister Atal Bihari Vajpayee, approved the privatisation of the two airports. The airports would be given a facelift by inviting bids from private parties. In the joint ventures, 74 per cent of the equity would be held by private partners and the rest by the Airports Authority of India. However, the government kept control of the critical services at the airports, including Air Traffic Control and security. The other affairs would be managed by the private partners. The Cabinet has included a clause whereby the private partners can also include foreign investors in the consortium. However, the essential requirement for the bidders in the joint venture would be that they should be operators of world class airports, Mr Rudy said. It was also decided to set up an empowered committee comprising, Finance Minister Jaswant Singh, Disinvestment Minister Arun Shourie, Law Minister Arun Jaitley and Mr Rudy to look into the overall parameters of the privatisation and modernisation process. The Cabinet, he said, also cleared a proposal for providing subsidy for Haj pilgrimage. “While challan has been issued to Bachchan for his premises in South Delhi’s Gulmohar Park area, Jaitley has been challaned for his New Friend’s colony house,” MCD’s Deputy Health Officer (South), B.K. Hazarika, told PTI here today. “A date has been fixed for their appearance before the corporation Magistrate” he said. Kanpur: A POTA court in Uttar Pradesh today ordered the detention of high-profile independent MLA Raghuraj Pratap Singh, alias Raja Bhaiya, in judicial custody here till September 26.